[dropcap]S[/dropcap]FU stands steadfast at the literal peak of a mountain, blessed with rain, wind, and occasional snowstorm. 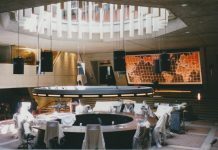 Despite having only just celebrated its 50th anniversary this academic year, it has grown well beyond its expected capacity, went through immense growing pains during its founding years, and has stood as a rebellious, radical campus with the only NCAA varsity sports system in all of Canada. It has also produced great minds and great research, and will undoubtedly continue to do so. All of this is supported by a widely unseen system of document processing and handling. As big as SFU is as an organisation, with both academic and administrative offices, the documents produced by SFU can be a staggering amount. We, as students, never stop to consider how our administrative needs are met, but in order for the show to go on, someone must work tirelessly in the background. Much of this is done at two very necessary offices of SFU — Special Collections and the Archives — two important centres for document processing, handling, and storage at SFU. They work to ensure that SFU’s special research needs and history are carefully recorded and maintained. Special Collections is up on the seventh floor of the W.A.C. Bennett Library, and despite the high volume of students moving in and out of the library, Special Collections has not received its fair share of attention. For most students, the library ceases to exist after the sixth floor, and even the sixth floor is used primarily for silent study spaces and some good sofa space to finish that paper due last week. For many students, even less attention is given to the Archives, which is housed on the bottom floor of the Maggie Benston Centre at the end of a long and winding hallway. While the Archives is sometimes used by students as a research source for assignments, they’ve only recently been in the spotlight with the TSSU strike action, when grades were withheld and stored in the Archives. Their role as the official repository of the university’s records, however, is largely unseen, but is one of the most important administrative duties needed for SFU to operate smoothly. [dropcap]S[/dropcap]pecial Collections, officially called Special Collections and Rare Books, works under the mandate of the Library to collect, safely store, and make accessible special and unique collections, ranging from posters, books, manuscripts, and photographs. The main difference between Special Collections and the rest of the library’s collections is that their collections do not circulate, meaning that they can only be viewed inside Special Collections and cannot be borrowed. Special Collections staff ensure that these collections are well maintained, catalogued, arranged, and stored for easy access. Despite being named “Special Collections”, access to Special Collections and its literal vault of collections is permitted to students, faculty, and the general population — nearly everyone — with a few exceptions due to privacy or preservation concerns. It also houses a great view, with the entire city sprawled out before your eyes and the North Shore Mountains and the slopes of Mount Seymour on the other side of the seventh floor. The overarching idea of the collections available in Special Collections is that they are either published material, such as books and posters, or they are unique records pertaining to a subject studied by SFU researchers. It contains both primary and secondary sources, allowing researchers to both see original pieces and secondary analysis or debates surrounding topics. The process of acquiring and maintaining its collections is not a simple task, a task the acting head archivist Melanie Hardbattle and division staff tackle every day. The process can start in many different ways, ranging from a Library staff member identifying a suitable item or collection, a third-party approaching Special Collections with a donation, or an SFU faculty member expressing a need for a specific item. Any acquisitions must be considered with relation to the current collection policy. They must ensure that both a standard of quality is met for all collections considered, and that the acquisition would play an obvious role for the SFU community. While Special Collections has a small budget to purchase pieces worthy of collection and that align with current collection policies, many pieces have arrived through generous donations. These donations are not just dusty old boxes being dropped in front of the Library’s doors, but require a series of meetings and considerations made for the role of Special Collections, the cost of maintaining the new collection, and the space needed for it. If those conditions are met, then a formal donation agreement can be signed. Once an agreement has been met, and financial considerations have been settled, the next step would be the accession of the new collection, which would see the collection be given a unique number as an identifier along with an overall description. After accession, a catalogue entry would be produced for the new collections. Like any Library collection, Special Collections ensures that a sense of order is maintained for its collections to ensure that similar items are grouped, and users can quickly look for desired collections. An archivist or Library staff member would examine the pieces to both write the entry and ensure that it is ready for use. The material is also rehoused, if necessary, to provide optimal storage conditions for preservation. In some cases a conservator would be consulted, and necessary steps would be taken to safeguard the collection, or to recommend restrictions to protect its fragile state. For example, Special Collections possesses an extremely rare page, or leaf, of the Gutenberg Bible. The Gutenberg Bible was the first bible to be printed with the movable type, the little wooden blocks with letters that can be rearranged — the start of the mass-production and popularization of books in Europe. It is sealed in a Mylar cover with the entry included with the binding to allow for observation while ensuring that the integrity of the very valuable piece is preserved. This process of acquisition, accession, and cataloguing can go without problems for many rounds, but as collections get larger and needs get specific, it may be necessary to split collections into numerous smaller but specific collections, all requiring new or modified entries and tags. For the foreseeable future, Special Collections will continue to expand their current collections. Many of their collections have been digitized and are available via the Library’s Digital Collections page. One challenge they will face is the inevitable change to records in digital format, where entire documents may be published exclusively in bytes, and how to change the procedures in Special Collections to preserve these types of records. [dropcap]O[/dropcap]fficially named Archives and Records Management, the SFU Archives hold SFU theses, financial documents, reels of film and VHS tapes, Peak newspaper publications, and many university-related documents. Like Special Collections holdings, the collections do not circulate and cannot be borrowed. According to its website, the SFU Archives “[supports] teaching, research, and university administration by acquiring, protecting and enabling access to university and private records of historical value. Archivists at SFU spend their time filtering the regular inflow of documents and records for their potential value to the SFU community. Even though deposits by University offices are voluntary, and the fact that offices retain some of their records for continued business purposes, the department receives piles and piles of documents and a constant stream of requests for access and information. They ensure that important documents are kept, while unnecessary ones are disposed of confidentially, and that collections are updated and expanded to fit the needs of the SFU community. Generally, the Archives will accept three classes of material — those created at SFU, material created by the SFU community (representing organisations like the Student Society, the TSSU, and other registered clubs), and those related to current SFU research exploits. Special Collections has a more liberal mandate of acquisitions that allow them to collect around subjects without a direct SFU relationship. The Archives has a strong focus on SFU members, SFU history, and SFU research exploits, with a focus on primary sources. 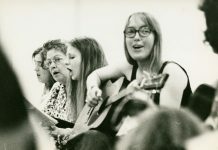 Special Collections and the Archives may seem to have different, sometimes opposing roles, but during the early years of SFU, the Archives worked under the umbrella of the Library, and librarians carried out archival duties. It was not until 1978 that the Archives was administratively separated from the Library, and not until the 1990s when the Archives settled into the new Maggie Benston Centre. [dropcap]A[/dropcap]ll deposits — whether it is a donation from a third party, or a record transferred from administrative offices — must first be examined to determine if they are fit to be handled by the Archives. Some documents may be more suitable for Special Collections, while others simply may not fit with SFU Archives’ acquisition mandate. Records Retention Schedules and Disposal Authorities (RRSDAs) guide archivists to determine which university records should be archived, and which should be confidentially destroyed. Some records can be retained for short periods of time, until they are disposed of at the end of their useful life cycle. Records deemed suitable for archiving are assessed in a separate process for classification in the holdings. New archival holdings can enter the system in two ways. The first method would be under the Records Management Program, and this path is taken by documents produced within the “walls” of SFU — administrative offices, department offices, and individual faculty members. Common records transferred to Archives from an SFU department include a semester’s set of course outlines, which serve to represent a department’s cycle of classes — a keepsake of that time. The second method would be through private third-party donors. The main point of consideration with private entries would be if it is applicable under the acquisition mandate — a good example would be donations from a faculty member’s family, perhaps pertaining to research conducted at SFU. If the conditions have been met, then a donation agreement can be discussed and signed between the Archives and the third-party, finalizing the donation. The discussion between the two is a very important step in the acquisition, as it will ensure that both parties understand the origins, future plans, and any privacy concerns for the donated material. After accepting a new set of records, archivists can either create a new collection or fonds, or in the case of accruals — collections that already exist — add the new records to one that already exists. Regardless of how entries arrived in the system, archivists must ensure university records that are no longer needed are confidentially shredded according to retention schedules and disposal authorities. This ensures that documents are examined on a systematic basis, and that only the necessary documents are held. Usually certain classes of documents, such as financial documents, can be disposed of based on a “lifecycle” — they are automatically disposed of at the end of a predetermined time period. Maintaining the balance between functional public access and privacy laws is a crucial overarching idea to Archival holdings, so much so that a Freedom of Information Privacy Officer is responsible for managing the balance and to accommodate applications for access to certain collections. 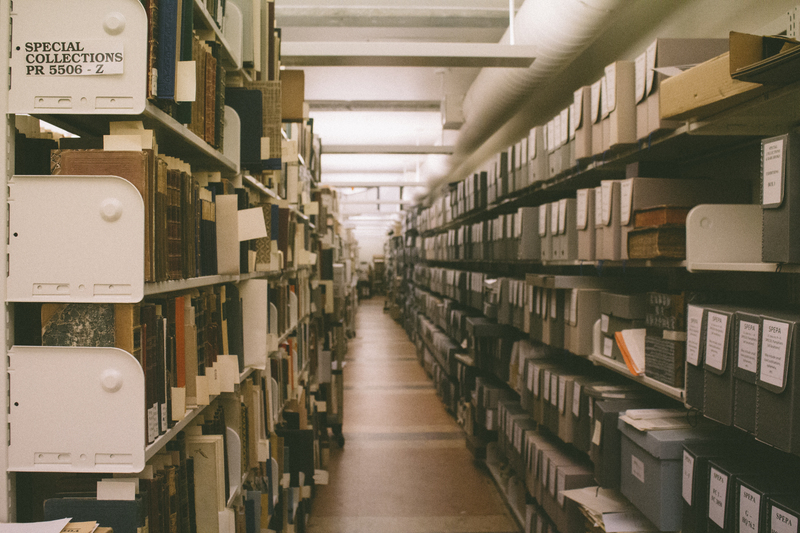 Because of the Freedom of Information and Protection of Privacy Act in BC, many of the holdings in both the Archives and Special Collections are partially or wholly restricted. [dropcap]A[/dropcap]t this point, it may have crossed your mind why SFU even needs a Special Collections or an Archives. Why not just go without the two and re-allocate that funding elsewhere? This is an important question that needs to be considered, especially since through student fees, every single SFU student has contributed to sustain and continue to grow its collections. As a student of the sciences, one may never need to take a trip up to Special Collections or down to the Archives as part of any course, and even the Humanities is limited to short trips, perhaps for a research paper. The costs to maintain a Special Collections may be higher than the equivalent amount in books and research papers, especially with special acquisitions like the Gutenberg Bible, and the enormous climate-controlled vault to carefully maintain these collections. But Special Collections and Archives are more important than its holdings. Special Collections serves to facilitate the more unique needs of researchers through its acquisitions, and for students, it serves to provide a physical existence to the material taught. There is a difference between going on Google to look up the Gutenberg Bible and its significance in the history and development of publication, and physically seeing an original leaf of the Gutenberg Bible. It also serves as a single office for the correct handling and care of unique and valuable pieces, saving costs for individual departments. 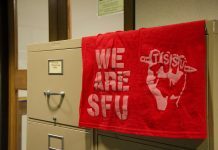 With the Archives, one must recognize that like any group of likeminded individuals, SFU is a unique society, serving as a microcosm within our society. It is not the actions and decisions of one body or person that makes SFU unique, but the collective actions and decisions taken on a daily basis throughout the decades that give SFU its “voice” — its place in history. As much as the Archives is the functional arm of document preservation and privacy protection, it serves to be its voice in time— to preserve SFU’s heart and soul. It serves to personify these cold concrete walls we attend. Like the box of Polaroids, old yearbooks, and vinyl records (or whatever you may collect) we all have somewhere, it serves to show snapshots of SFU’s past. Any collection of buildings can be a university, any group of students can be a student society, and whatever events and research conducted can be done and published, but as a repository of those events and memories, the Archives captures SFU through its holdings, and must continue to do so. Just like the box in our attics, or the photos we have framed in our living rooms, they can represent the public face of us, the moments we can share with everyone. But the photos in that box show a more intimate picture of who we are. It shows the memories we carry with us from house to house, as we progress and continue to change through time. It serves as a place of static calm in our ever-changing and rapidly-moving world, where we can take a moment to look back. The SFU Archives is the metaphorical box in our attics, showing SFU in snapshots from the inside, an intimate history of SFU’s conception. We see everything from its growing pains to its current state as a school. Even though Special Collections and the Archives may not be a direct part of our day-to-day lives up at SFU, their roles at SFU are undeniably a part of what makes our university unique. Ever since the doors of SFU opened to the public, Special Collections and Rare Books have been acquiring, preserving, and making accessible, valuable pieces to aid our research needs. Their collections range from local event posters, unique manuscripts, all the way to pieces of global significance. The Archives and Records Management, originally working under the mandate of the library, continues to accrue new holdings, showing among other topics, the history of SFU, unique snapshots of research and activities that have taken place at SFU, and SFU’s research exploits and topics of interest. They also temporarily hold and confidentially destroy important documents, maintaining the balance between privacy and public access. Whether for simple documentation, research, or for the chance to look back in the past, the two departments are not only the gears that help SFU with valuable document processing, but are important resources for anyone at SFU. Like a box in the attic, you never know what you’re going to find.